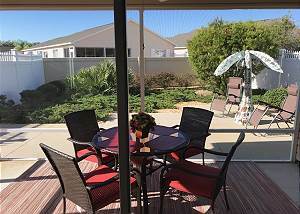 The Villages, Florida United States - GAS GOLF CART 2 BEDROOM COURTYARD VILLA THE VILLAGES FL GREAT LOCATION | RE/MAX PREMIER REALTY Inc.
Nicely decorated two bedroom, two bath courtyard villa in the Village of Hadley. New 50 inch HDTV in the living area as well as TV's in each bedroom with cable and WiFi. The guest bedroom/bathroom area has a pocket door for added privacy. Centrally located in the Village of Hadley with easy access to all 3 town squares for dining, shopping and live nightly entertainment in the gas golf cart included with this rental! The courtyard villa offers the most privacy with enclosed back yard. Available for seasonal or long term rental. Naomi W. from Quakertown, PA US recommends this vacation rental. A well maintained and very clean rental. Perfect location. Loved the use of the golf cart. Had a great time. Thank you for your response come back to see us! Ed S. from United States recommends this vacation rental. The accommodations were very good. Everything I needed to start my stay was available to me. Dena from the rental company was outstanding. She answered all my questions and was always available when I needed help. So happy to hear you enjoyed your stay, hope to see you next year!